If you're flying with your best non-human friend, here's what you should know about your airline's pet policy. © Provided by Gannett Co., Inc. A service dog strolls April 1, 2017, down the aisle of a United Airlines plane at Newark Liberty International Airport while taking part in a training exercise, in Newark, N.J. If you're traveling with your favorite four-legged friend, make sure you understand your airline's pet policy before you board. Most airlines allow your pet to fly for a fee providing your animal is small enough that its carrier fits underneath the seat in front of you. Airlines often wave fees and carrier requirements if you are traveling with a service or therapy animal. However, many airlines are cracking down on people who have abused this policy. You're now required to submit information about your animal and forms from your mental health professional in advance of flying. An airline has the right to deny boarding to your animal if it is not well-behaved. That can mean no scratching, excessive whining or barking, biting or urinating/defecating on the plane or in the gate area. And many airlines ask that you not sedate your animal before a flight as it can be unpredictable how an animal will react to medication at altitude. Here are highlights of the pet policies for some of the biggest airlines at Phoenix Sky Harbor International Airport. Check your airline's website or call the reservations number for complete information. Pet fee: $125 carry on, $200 as cargo each way. If your itinerary contains a layover of more than four hours, you may be charged the fee per flight segment. No charge for service animals. Minimum age of pet: 8 weeks for travel within U.S., 16 weeks traveling into the U.S. Number of kennels allowed in cabin: Seven on American flights, five on American Eagle. Carrier dimensions: Depends on the aircraft. Contact American for a reservation for your pet and to get the specific dimensions for your aircraft. Generally speaking, the kennel must fit in the space in front of you and have room for your pet to comfortably move around. Documentation for emotional support animals: American requires three forms: a mental health professional form, behavior guidelines form and an animal sanitation form if your flight is longer than eight hours. In addition, you have to make a reservation with the Special Assistance Desk 48 hours in advance. The airline will validate your documentation by contacting your mental health professional. Not allowed as emotional support animals: Amphibians, ferrets, goats, hedgehogs, insects, reptiles, rodents, snakes, spiders, sugar gliders, non-household birds, animals with tusks/horns/hooves (excludes trained miniature horses), any animal that is dirty or has an odor. Breed restrictions: American does not accept brachycephalic or snub-nosed dogs (such as American and French bulldogs and Boston terriers) as checked pets. Pet fee: $125 in the cabin for domestic flights, $200 international each way. Animals can be shipped through Delta Cargo. No charge for service animals. Minimum age of pet: At least 10 weeks old for domestic travel, 15 weeks for travel into the European Union and 16 weeks for international travel into the U.S. Number of kennels allowed in cabin: Check with Delta. Not all aircraft can accommodate pets. Carrier dimensions: Depends on the aircraft. Contact Delta to make a reservation for your pet and get specific dimensions for your flight. Documentation for emotional support animals: Fill out the Emotional Support PDF and upload it to your “My Trips” account. It requires documentation from a mental health professional, a veterinary health form and confirmation of animal training. You must upload this 48 hours prior to departure. Not allowed as emotional support animals: Hedgehogs, ferrets, insects, rodents, snakes, spiders, sugar gliders, reptiles, amphibians, goats, non-household birds, animals with tusks/horns/hooves, animals that are dirty or have a foul odor. Banned breeds: Pit bull breeds. Pet fee: $75 each way in the cabin. Frontier does not transport animals in cargo. No fee for service animals. Number of kennels allowed in cabin: Up to 10. Carrier dimensions: Carrier must fit under the seat in front of you. The dimensions are 18 inches long by 14 inches wide by 8 inches high. Minimum age of pet: Older than 8 weeks. Documentation required for emotional support animals: You'll need to download these forms, fill them and and upload to Frontier's site 48 hours before travel. These include a form filled out by your mental health professional and an animal behavior acknowledgment form. You also must book a reservation for the animal at least 48 hours in advance. Not allowed as emotional support animals: Only dogs or cats and miniature horses are considered emotional support animals. Dogs, cats, rabbits, guinea pigs, hamsters and small household birds may be carried on flights within the United States with the pet fee. No reptiles or arachnids. Only dogs and cats can travel to international destinations. Banned breeds: No specific breed restrictions but the airline notes pets must be harmless, not disruptive, odorless, and require no attention during flight. Pet fee: $95 in the cabin each way. No fee for service animals. Southwest does not fly animals as cargo or on international flights. You must make a reservation for your animal by calling 800-435-9792. Number of kennels allowed in cabin: Up to six. Carrier dimensions: 18.5 inches long by 13.5 inches wide by 8.5 inches high. The carrier must fit under the seat in front of you and the pet must be able to stand up and move around in the kennel. The carrier counts as a carry-on. Southwest sells carriers that fit its requirements. Minimum age of pet: 8 weeks. Documentation required for emotional support animals: A letter from a licensed mental health professional stating that the passenger has a mental or emotional disability recognized in the diagnostic and statistical manual of mental disorders, that the passenger needs the animal for air travel or for an activity at the destination, that the passenger is under his/her care, and the date and type of professional license as well as where it was issued. Not allowed as emotional support animals: Only dogs and cats can be emotional support animals. Banned breeds: None, but Southwest reserves the right to deny boarding to a disruptive pet. This includes scratching, excessive whining or barking, growling, biting, lunging or urinating/defecating in the cabin or gate area. Pet fee: $110 each way in the cabin. Spirit does not transport animals in cargo. No fee for service animals. Number of kennels allowed in cabin: Up to four. Carrier dimensions: Combined weight of carrier and animal cannot exceed 40 pounds. Maximum container size is 18 inches long by 14 inches wide by 9 inches high. Documentation required for emotional support animals: At least 48 hours in advance, you must fill out this form and upload the following forms: one from your mental health professional, a veterinary health form and a passenger acknowledgement form. Not allowed as emotional support animals: Snakes and other reptiles, rodents, ferrets, sugar gliders and spiders. For all other animals, the airline considers on a case-by-case basis factors such as "the animal's size, whether it poses a direct threat to the health or safety of others, whether it would cause a significant disruption of cabin service and whether if the animal is prohibited from entering a foreign country." Banned breeds: None, but if the animal causes disruption, has not been trained to function as a service animal in a public setting or shows any signs of aggression, it will not be allowed to travel. Pet fee: $125 in the cabin each way. No charge for service animals. United has a Petsafe program for shipping pets as cargo. 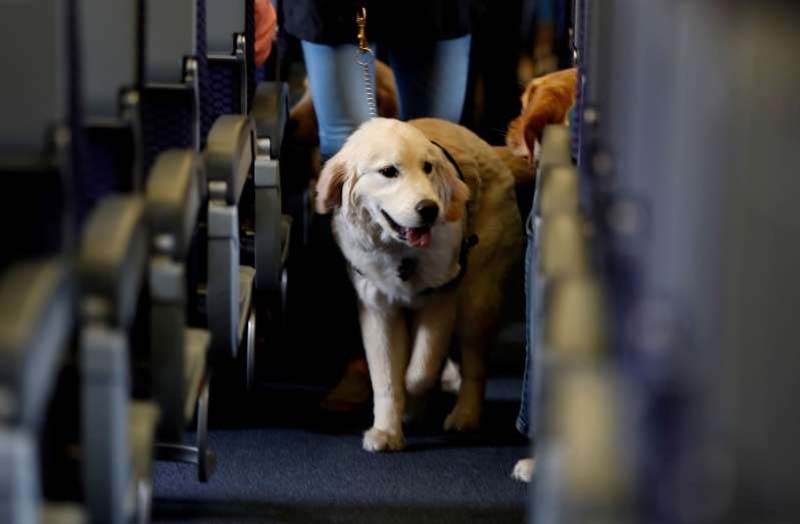 The airline also has a tool to figure out what seat can accommodate your service animal. Number of kennels allowed in cabin: Two in premium, four in economy. Call 800-864-8331 for a pet reservation at least 48 hours in advance. Carrier dimensions: The carrier must fit completely under the seat in front of the customer and remain there at all times. Dimensions are 17.5 inches long by 12 inches wide by 7.5 inches high for hard-sided kennels and 18 inches long by 11 inches wide by 11 inches high for soft-sided carriers. Minimum age of pet: 8 weeks for domestic flights, 4 months for international travel. Documentation required for emotional support animals: You must have a letter from a licensed mental health professional, a veterinary health form documenting health/vaccination records and confirmation that the animal has been trained to behave in a public setting. Not allowed as emotional support animals: Rodents, reptiles, snakes and ferrets. The airline can answer questions about support animals at 800-228-2744. Banned breeds: None, but the animal cannot weigh more than than 65 pounds.